The novel tells the story of a pig named Wilbur and his friendship with a barn spider named Charlotte. 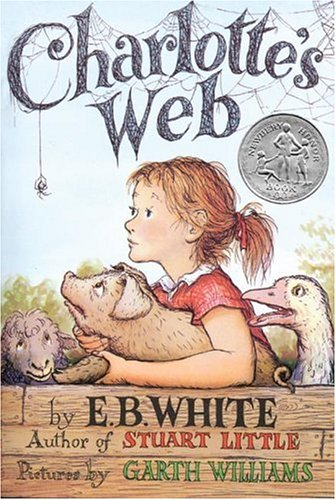 When Wilbur is in danger of being slaughtered by the farmer, Charlotte writes messages praising Wilbur (such as "Some Pig") in her web in order to persuade the farmer to let him live. Wilbur’s new home was in the lower part of the barn, directly underneath the cows. Mr. Zuckerman knew that a manure pile is a good place to keep a young pig. Why is a manure pile warm and comfortable and the south side of the barn? Could design a habitat for Wilbur using paper and glue and simulate plant items for art supply store. Engr. Learn how the tools for making things, folding paper for strength, cutting tools, glue are used. Life science: why is manure warm? What science process is happening? Sturdy Structures: Build a new home for Wilbur - how could you create a crate that could change its size as Wilbur grows? How does a spider engineer her web to fulfill its purpose? What strategies does a spider use to ensure the web will not break? How is Charlotte herself designed to be good at catching flies and spinning webs? Why is Charlotte able to spin a web and Wilbur cannot? How are all the barnyard animals designed to fulfill their purposes and their methods of survival - Templeton the rat, Wilbur the pig, the goose, etc.? Engineers often examine nature to get ideas on how to design things (biomimetics) - using spider’s strong and waterproof silk strands to design synthetic silk fibers without toxic chemicals. How can Charlotte save Wilbur from his fate at Christmastime? How does Charlotte’s way of thinking represent the mindset of an Engineer? What do you think Charlotte can do - brainstorming session/ potential building lesson. 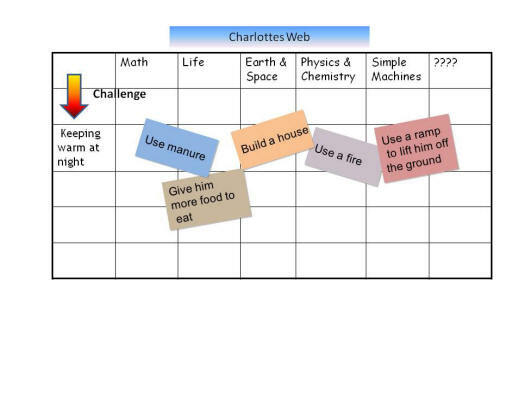 p. 77 How does Charlotte use her resources to help Wilbur? How does the Ferris wheel represent a turning point in Fern’s life? What is symbolic about the wheel? How does a Ferris Wheel work - looking at the mechanics behind a Ferris Wheel. As an approach to problem-solving and design, biomimicry is impacting the way engineers design our products and systems. More and more, engineers are consulting nature's genius to answer pressing questions such as, "How will we harness energy?" or "How will we make our materials?" and "How will we come up with new product designs to compete in a global marketplace?" We are discovering that for every human challenge, nature has a time-tested solution. At the core of these biomimicry applications lie fundamental, intuitive concepts. Derived from bios, meaning life, and mimesis, meaning to imitate, biomimicry is not a new way of thinking — we have studied nature for solutions since the beginning of human history. Early human civilizations evolved by play, imitation, and trial and error. If you watch animals in nature, or even small children, you see that they, too, learn by play, imitation, and trial and error. Many indigenous cultures still engage in a more connected relationship with the natural world. They observe animals and birds to learn the best techniques for stalking prey, identifing edible foods, and predicting weather changes. Some of our early inventions were discovered by watching nature; for example, the airplane (inspired by birds of flight) and Velcro® (invented in 1948 by a Swiss mountaineer who returned from a hike covered in burrs). In essence, biomimicry provides a holistic framework for engineering design that challenges us to look beyond what we see in the human-made environment to the more subtle designs found in nature. These subtle designs can lead to innovative materials and products that have never before existed.